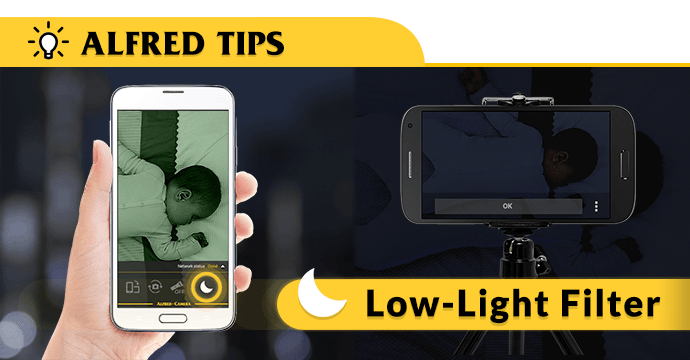 All about Low-Light Filter - Frequently Asked - Alfred Center | get the most out of the best home security app! Low-Light Filter is one of Alfred’s most popular features. A lot of Superheroes have told us they were amazed when they found out they don’t need any extra equipment for Alfred’s Low-Light Filter to work. How did we achieve this? How can you help this feature unleash its full potential? When should you enable Auto Low-Light Filter? Read all about Low-Light Filter today! Alfred achieves Low-Light Filter by increasing contrast and reducing color. Like how it is with cameras, you can change the contrast, color, and other values for the result/effect that you consider ideal. In terms of Low-Light Filter, we aim at emphasizing the shape or outline of everything in sight. For example, anything that looks like noise in normal photos can actually help the outline stand out when you get the algorithm right. Sounds awesome, right? We’d like to think so, too! However, without infrared equipment, Alfred’s Low-Light Filter is not without its flaws. The most common complaint we get is Low-Light Filter doesn’t capture all that much when it is completely dark. Naturally, we are continuously working on polishing all of Alfred’s features. However, there is always going to be a limit to what the algorithm can do. The best tip we can offer all you Superheroes for the moment is investing in a light with motion sensor. However, you might want to run some experiments to find the best setup because when the light is too close to the Camera device, the images will end up looking too washed-out. One of Alfred’s relatively new features is called Auto Low-Light Filter. Auto Low-Light Filter works by detecting ambient light. When there isn’t enough, Low-Light Filter will be automatically enabled. When should you enable Auto Low-Light Filter? When the view of your Camera device is pretty much all dark. For example, if you have a Camera device looking out from your front porch and you don’t mind so much the Events recorded around dawn are less colorful than usual (as it might take a while for the algorithm to detect the difference). When should you turn Low-Light Filter on/off manually? When there is enough ambient light, but you are trying to observe a darker spot. For example, if your cat is sleeping in a covered cat bed in broad daylight. Do you have any other Low-Light Filter-related questions that you want us to answer? Don’t forget to ask them by replying to this post! Do I need an infrared camera for my security system to function in the dark? High power IR LED source. Does it help at night? HD quality not so HD or phone resolution just not good enough? Night vision can't see anything, how do i activate it? Can I retrieve video not caught by motion detection? Alfred Premium & Alfred Plus: Unlock Exclusive Features! My night time mode doesn't help at all? I need night vision please? Should the motion detector work in the dark? Google pixel 3 Night vision? Auto-low light filter won't turn off! Save Data & Energy with Alfred's Remote Switch! Missing Events, Stop recording before End of Event -> how to fix? Why do my night vision turn everything black. I have pretty good camera’s, but for some reason the night vision does not work when the lights are off. Like we explained in the post, Alfred’s Night Vision doesn’t work the same way infrared lenses do. 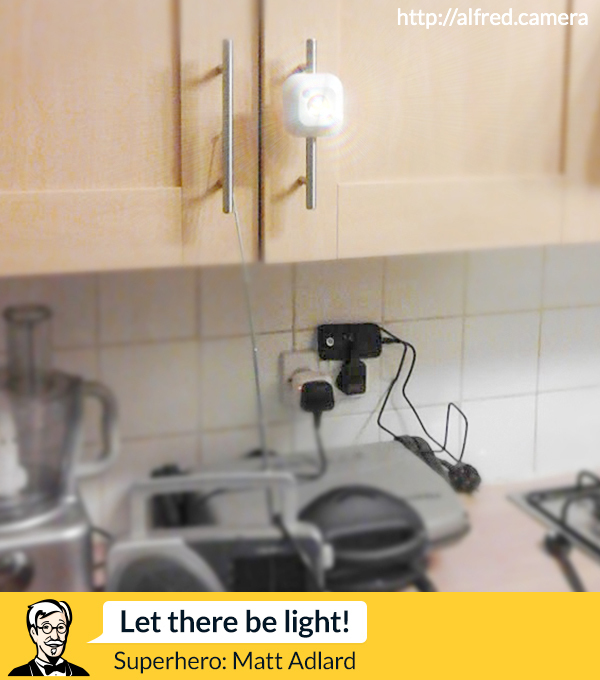 You’d need a little bit of light for it to work! Please experiment with different setups. We hope you’ll be able to make the most out of Night Vision! Alfred’s Night Vision needs a bit of light, but definitely not TOO much either. If there is enough light and Night Vision is enabled, chances are the images will be very very white. If you can,put Alfred across the room looking toward light. At least it seems best. Can you change or turn on and off the low light filter whike recording and watching live feed and if so will it be noticeable by someone that you did on the cameras side? Yes you can! Just tap on the moon icon. The screen should stay dark as well. Night vision is solid black! Don’t like it! What’s the sense in the screen being black! I’m trying to keep my family safe! If it’s black it not worth it! Is there any light (even dim light) at all where you set up the Camera? Alfred’s Low-Light Filter processes images so you can see the outline. It is not an infrared equipment that allows you to see in total darkness. If you are trying to guard your driveway for example, a light with motion sensor would be really helpful. Please let me know if you have more questions/feedback! You can always send me a photo of your setup so I can come up with specific optimization advice. Sorry to hear you are not happy with Alfred’s Low-Light Filter. Would you mind sharing a link to an Event with us so we can take a look and give you more specific advice? Z what’s the name of that app??? Hello, the low light filter seems to work using the phones onboard infrared light. If I supplemented the small light with a stronger infrared light would it help with the recognition? Thanks for your time. Love your app! Thanks for experimenting with different settings to make Alfred work better! Since Alfred’s Low-Light Filter still needs a little light to work, a stronger infrared light could indeed optimize the recognition. If you need further assistance, you can always send us a screenshot or a link to an Event so we can take a look and give you more specific advice. Thanks for the information about the low light filter. I purchased a motion sensor light but it kept my son awake every time he moved. I am recording his seizures. I have a very small night light in the room near the camera. It’s ok but I would like to find an infrared bulb to put in there. If anyone has any suggestions or uses Alfred to monitor seizures, please let me know. This is a fantastic app for me. After him having seizures for 20 years, Alfred was the first product that actually picked up and recorded one of his seizures! BRAVO! I wish I could afford the upgrade. You can buy a Red USB Strip light and run along his head board. Couple bucks at an electronics store.